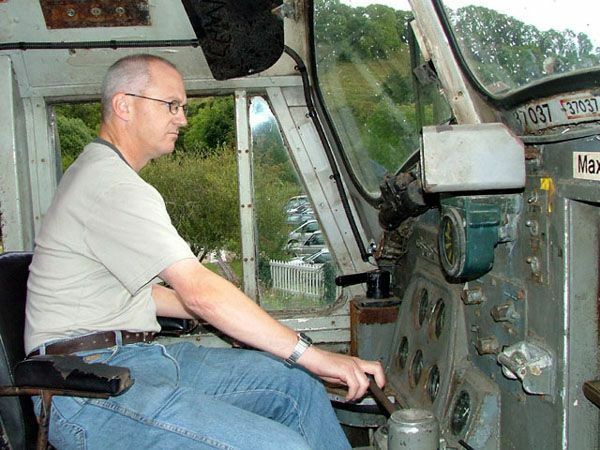 On the South Devon Railway we can make the dream a reality for yourself, a family member or friend with one of our Diesel Driver Experience Days. Drive a heritage diesel locomotive hauling a rake of coaches over the full line. The dates for the 2019 programme are below (correct as of 28 Feb 19) and contact the SDR by email trains@southdevonrailway.org or telephone 01364 642338 for further details. Have you ever watched a mainline train and wondered just what it would be like to be in the driver’s seat in charge? Well here on the South Devon Railway we can provide you, or even a relative, friend or perhaps a work colleague with the chance to find out. On selected dates during the 2019 season, we shall be running more of our very popular Diesel Driver Experience Days. On each date a maximum of five people will have the chance to participate in a day full of action and enjoyment, during which they will have the chance to make two full round trips (28 miles) in the cab over the full length of the line between Buckfastleigh and Totnes Littlehempston. On one trip there will be the chance to act as the Driver’s Assistant or Secondman, helping keep a keen eye out, assisting with the checking of signals, and maybe even performing the uncoupling and coupling of the locomotive to its train. On the other trip dreams really do come true and it is time to occupy the drivers seat and take charge of your very own train. On most days, the regular public services will also be in operation so there will be the added responsibility of running to a schedule that allows the trains to pass at Bishops Bridge Loop near Staverton Station. Here there will be the chance to witness the sophisticated signalling system, and the use of single line tokens and train staff, which makes this operation safe. On each Driver Experience Day up to a maximum number of 5 people can book. This helps ensure that everyone has lots of opportunity to be actively involved in the day’s activities. In addition participants may be accompanied by a small group of friends or relatives, these travelling in the train, and perhaps filming you fulfilling the dreams of your youth! Participants need to be over the age of 18 to take part, and also need to be reasonably fit and healthy. The wearing of old clothes and stout shoes is recommended, whilst dustcoat and gloves will provided as required on the day. During the day we stop for a short lunch break at Totnes. Participants and guests can bring a packed lunch if they wish, or can visit the coffee shop at the adjacent Rare Breeds Farm where a selection of hot and cold snacks and other refreshments can be obtained. During the break it may be possible to view some of the more modern traction that operates on the adjacent national system, these being very different to the older diesel locomotive designs, one of which will be in use on your train. There will also be plenty of time to take photos and if they wish guests may also have a look onboard the locomotive. At the end of the day all participants will receive a framed certificate recording their day with us. A link to the booking notes is available here and bookings on the SDR website from here.